“Crystal's missing,” Gram shouted from the middle of the yard. he faded wall banner that proclaimed Clara's coffee shop “Home of the Best Pineapple Upside-Down Cake in the World!” fluttered as the ceiling fan turned lazily overhead. The fan stirred wisps of Samantha Forster's reddish hair as she tilted her head back and closed her eyes. It was barely noon on an early June day, but before driving into Darton with her dad, she'd put in a full morning of work with the horses on River Bend Ranch. Sam smelled the giant cheeseburgers and french fries before she opened her eyes to see them. Sitting across the table from her, Dad rubbed his palms together. His sun-browned face creased in a smile as Clara positioned plates in front of each of them. “You're not about to get another wild horse out there, are you?” Clara asked. “Not so long as I'm livin' there,” Dad muttered. Sam smothered her smile. She loved wild horses and she was lucky enough to count several of them as friends. Ace and Popcorn, Dark Sunshine, and the mighty silver stallion known as the Phantom paraded through her imagination. But Dad was a cattle rancher. He didn't like sharing the range with the mustangs. Still, Dad had a horseman's heart and sometimes he helped wild horses in spite of himself. “What's HARP mean, again?” Clara asked. Sam was a little surprised at Clara's interest. She looked up at the woman's face, framed by a pink scarf knotted around her hair. Two ends stuck up like rabbit's ears, adding to Clara's alert expression. Ice clinked as Clara poured water into their glasses. “The Horse and Rider Protection program,” Sam explained. “That's right. For bad girls and bad horses,” Clara mused. She looked toward the back of her coffee shop, nodding. Brynna called the girls “at risk,” but Dad was being pretty generous in his description. After all, Mikki, the first HARP girl they'd had at the ranch, had set his barn on fire before she started changing her ways. But Mikki had changed, and so had Popcorn. Both had become more trusting of people. That's what made Sam excited about this summer. The bell over the coffee shop's front door jingled. When she saw two new customers walk in, Clara stepped back from their table. As Clara hurried off to seat her customers, Dad looked after her. “Sure hope the donation's a cake or pie,” he grumbled. Her pulse beat a little faster. Across the parking lot, Clara's coffee shop faced Phil's Fill-Up, a gas station and general store, but on the other side, acres of pastureland stretched toward Darton. The fenced land belonged to a horse-loving banker, and though Sam hadn't noticed any new horses, it was possible she'd missed one. Sam waited until Dad had taken a bite of his cheeseburger, then asked, “I wonder if Clara knows the HARP horses have to be mustangs?” Then she casually popped a French fry into her mouth. Just the same, he watched Clara as if she were a time bomb. Sam started eating her own delicious lunch. Even though Gram made great home-cooked meals, Sam missed going out to eat. When she'd lived in San Francisco with Aunt Sue, they'd had about half their meals in restaurants. Although Clara's lacked a big city atmosphere, it was still a treat. visiting grandchildren. Instead, Dad had pulled the truck and empty horse trailer into the parking lot between Clara's and Phil's Fill-Up. Pulling on the parking brake, he'd declared that as long as they needed chicken feed from the Alkali store, they might as well have lunch, too. But now Dad was watching the clock. No surprise there, Sam thought. Dad couldn't forget the work awaiting him at home. Besides, Brynna would arrive at River Bend Ranch with the two new HARP girls pretty soon. Sam had promised herself she'd be tolerant and understanding, no matter what kind of trouble the girls had been in. At River Bend Ranch, their pasts wouldn't matter. She was feeling quite mature as she sipped her milk shake. , Sam thought, but then her tranquility wavered. Dad put down his cheeseburger and his expression turned serious. “About that chicken feed,” he reminded her. Sam knew he wasn't talking about the burlap bags of feed they'd just loaded into the truck. “Dad, I didn't spill it,” Sam insisted. Island Red hens each morning, Dad was certain she was to blame for the grains of cracked corn he'd found on the tack room floor. She let him talk, even though she didn't see why it was such a big deal. Her expression must have given her away. “Okay,” Sam agreed. The cheeseburger felt heavy in her stomach. Her arms crawled with chills. “Okay,” Sam said again. She wished she could keep the scared sound out of her voice. She had nothing against snakes. She thought they were kind of interesting, but the two years she'd spent away from the ranch in San Francisco had done more than expose her to neat restaurants. She'd become nervous over things most ranch girls took for granted. “I'll be really careful,” Sam promised. She felt relieved as Millie rushed in through the restaurant's back door. Still trying to tie her apron strings, the tardy waitress attracted Dad's attention for a minute. Then Clara crossed the coffee shop, wagging her order pad with raised eyebrows as she approached their table.
. Far out, blurred by heat waves, the Calico Mountains zigzagged against the blue Nevada sky. She couldn't imagine where a rush of lunch-hour diners would come from. Dad placed the last of his burger on his plate and stared at it as if he'd lost his appetite. Dad leaned back in his chair with a tolerant smile. “Go on, then,” he told her. what a grulla-colored horse looked like. “Goin' crazy?” Dad repeated. 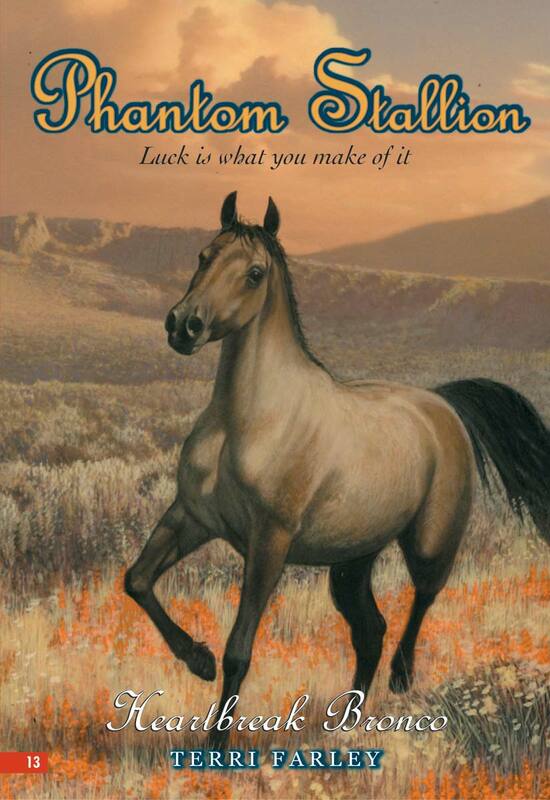 He chuckled, rubbed his forehead, and gave Sam a wry look as if he'd given up expecting normal horses. Clara paused to meet Sam's eyes. A dollar and a piece of cake? “Can I see him?” Sam asked, but Dad's voice was louder. “Of course you are,” Dad began. Dad shrugged casually, but Sam thought he looked eager to get going. Sam shook her head. She'd heard of Young Ranchers of America. It was a local group modeled on Future Farmers of America, but she didn't know any kids who belonged. Sam was trying to remember what happened in a claiming race. “Sounds like a good idea,” Dad said. He stood and pulled some dollar bills from his pocket, looking relieved, but Sam wasn't sure Clara had finished explaining her plan for the horse named Jinx. Before she could finish her sentence, Phil, the owner of the gas station next door, burst into the coffee shop so fast that the welcoming bell's delicate tinkle was a clash. Brakes squealed outside. Sam ran to the front window in time to see a horse dash past the back bumper of Dad's parked truck. Smoky gray and determined, the horse shied at a blowing piece of newspaper. Would he turn back? No. Hooves clattering, the horse galloped past the coffee shop and down the highway, headed for Darton. His black mane stood up like a Mohawk haircut. His tail streamed, glossy and thick, behind him. He moved with a liquid speed Sam had only seen once before. “Look at him run,” Sam gasped. No one heard her words over the blaring horn and the sickening clash of metal crushing metal as a green sedan slammed into the back of Dad's truck. It was going to be a bad afternoon, Sam realized as she pushed away from the window. caught up with him as he hurried outside. Summer heat hit her at the same time she saw Jake jump out of the driver's seat of his mother's car. The afternoon had turned from bad to rotten. Sam turned away from the accident. She stared after the sound of hooves hitting on hot asphalt. The grulla gelding kept running. He didn't look back to see if the clamor of cars and people followed him. He didn't lunge into the sand for better traction. Sam couldn't look away from the escaping horse. Head and tail flung high, eyes set on his own goal, the grulla ran right down the dotted white line in the middle of the highway.